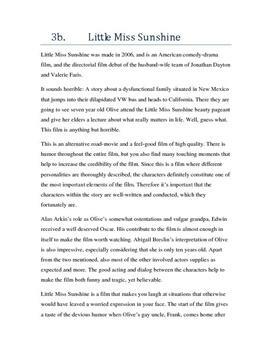 En analyse på engelsk av filmen Little Miss Sunshine fra 2006. Oppgaven presenterer film med handling og personer og ser på sener i filmen, oppbygning og virkemidler som er brukt. Little Miss Sunshine was made in 2006, and is an American comedy-drama film, and the directorial film debut of the husband-wife team of Jonathan Dayton and Valerie Faris. It sounds horrible: A story about a dysfunctional family situated in New Mexico that jumps into their dilapidated VW bus and heads to California.